Confirm bounce and complaint files are setup properly. 1. Login into Easysendy and go to servers. 5. Go to Setting -> SMTP & API info. 6. Click on “Copy” for the field “SMTP Username”. 8. Go to Mandrill and click on “+New API Key” button. 9. Enter description and click on “Create API Key” button. 10. Copy the “API Key” form the page. 11. Go to Easysendy and paste it for “Api Key” field. 12. Enter input for the below listed fields. 13. Go to Mandrill, go to Dashboard. 14. Get the mails per hour. 16. Enter email id and click on “Validate Server” button. 17. Click on the email “Please validate the server”. 18. Click on the link. 19. The server is validated. 20. Go to Mandrill and click on “Sending Domains”’. 21. Click on “Verify a Domain” button. 22. 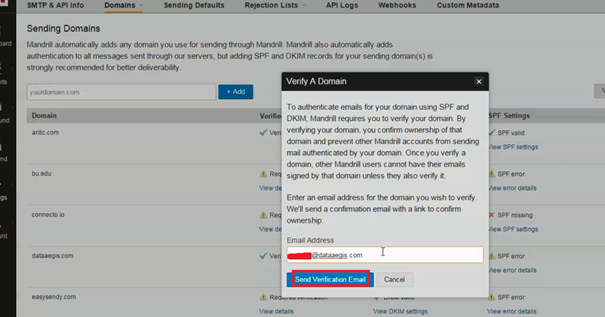 Enter email and click on “Send Verification Email” button. Note: You need to add and activate your own tracking domain to your EasySendy Dashboard account for good email delivery. Follow this link, to configure your own tracking domain to your EasySendy Dashboard.